The calm winds arrived and sea state of 2-3 all day provided ideal survey conditions. Unfortunately no one told the dolphins that and no sightings was the score at the end of the day. In the morning we made a port call to Killybegs to pick up some equipment. As we headed back out into Donegal Bay, promised light winds had not yet materialised, surveying in force five with strong glare was difficult. No sightings were made by nightfall. Force 6-7 wilds and high seas meant a day in the office catching up on paperwork. Calm seas this morning made for ideal viewing conditions and resulted in sightings of two groups of pilot whales (13 animals) and one group of 10 Atlantic white-sided dolphins. A distant glimpse of a small whale went unidentified as the animal vanished without a trace. By late afternoon the sea state had picked up and by tea-time was sea state five with a heavy fog which brought survey effort to a halt. A poor sea state of 5-6 made for difficult survey conditions, however a single distant blow of a large whale (possibly a fin whale) was sighted in the morning. Sea state of 5 this morning died away during the day to a sea state of 2 at nightfall. The only two sightings of the day were made in the roughest conditions! 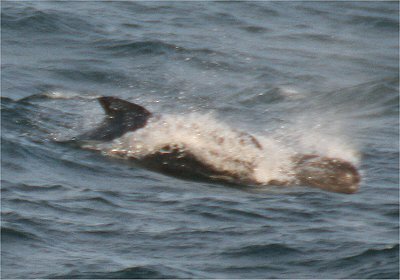 At 08:30 a group of 30-35 pilot whales approached the stationary ship and spent about an hour mooching around. In the midst of all this a fin whale appeared about 500m away and sat logging in the water for a few minutes... probably wondering what all the commotion was about! With sea state 5-6 all day and a building swell, no sightings were recorded. More poor conditions with sea state 5-6 all day. However survey effort did produce a sighting of three sperm whales logging at the surface, that passed within 300m of the ship. More wind forecast for tomorrow! The weather had deteriorated to a sea state 5 this morning and stayed that way with swell also picking up during the day. Sighting conditions were therefore difficult, however soon after survey effort started some very distant but distinct splashes revealed a beaked whale breaching clear of the water some 2km away. Things went quiet then until late evening when, as daylight receded, a group of 20 pilot whales came barging through the waves and proceded to chase the ship for ten or fifteen minutes. However, with the ship doing ten knots and the sea conditions rough, they soon fell astern and vanished in the wave clutter. A very calm day with sea state zero to start the day. We were in the centre of the Rockall Trough with the nearest land 4km away... straight down! First sighting of the day was a distant small blow... either a very small sperm whale or perhaps a beaked whale, however at no time was the animal seen so a mystery it remained.